Approximately 140 km north of Prince George, just off of Highway 97 on Carp Lake Road, is the McLeod Lake Indian Band. Close to 100 people, both Band members and non-Band members call this place home and the community features a Band hall with a gymnasium, a Natural Resource Centre, Community Daycare, and a gas bar with a convenience store, commercial kitchen, and café. The McLeod Lake Tse’khene are traditionally a nomadic people who have inhabited the basins of the Parsnip and Finlay Rivers and the Peace River valley for thousands of years, hunting and gathering, following the seasons. After the Northwest Company established a trading post at McLeod Lake in 1805, the Tse’khene people established trap lines and sold furs at the trading post. Their traditional pattern of life became securing game in the fall, trapping in the winter and spring, and picking berries and hunting birds and fish in the summer. This traditional lifestyle changed dramatically in the 1960s, when the provincial railway and John Hart Highway were built, opening up their land to non-indigenous settlement and economic development. In 1969, the W.A.C. 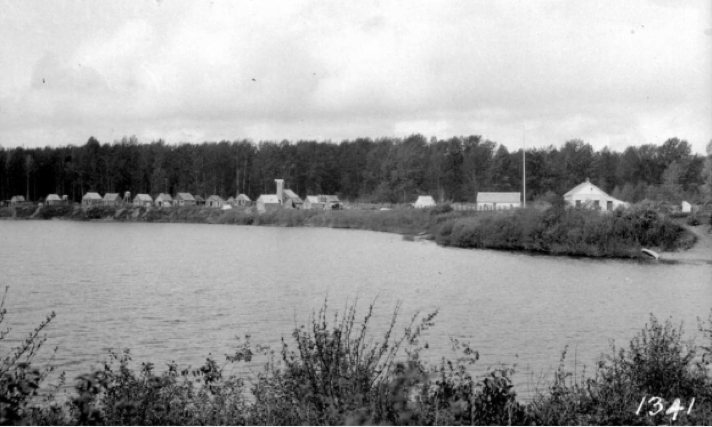 Bennett Dam created a 1,683 square km lake, flooding many of the traditional hunting and trapping areas of the McLeod Lake Tse’khene. With their traditional livelihood gone, in just a few years the Tse’khene people were transformed from a self-sufficient hunting and gathering society into an impoverished and despondent society, while nearby municipalities like Prince George and Mackenzie were thriving from the growing forest industry. In the late 1970s, the Band decided this situation could not continue. After several attempts to gain contracts from forest companies, they founded Duz Cho Logging, a company that reflected the determination and resilience of the Tse’khene people. Its success would finance a journey to economic independence for the McLeod Lake Indian Band that started with them adhering to Treaty No. 8 in the year 2000. The Treaty provided them with $38 million, 20,000 ha of Indian Reserve Lands, and a recognized traditional territory of 108,000 square km. While the McLeod Lake Indian Band continues to build on its forestry operations today, diversifying its economic activities into other industry sectors has been a priority for more than a decade as evidenced by Duz Cho Construction, Summit Pipeline Services (2004-2012), and Duz Cho Forest Products. The Tse’khene Community Development Corporation, wholly owned by McLeod Lake Indian Band, has constructed a gas bar and convenience store on IR No. 1 in McLeod Lake. Tse’khene Food & Fuel Ltd. also houses a commercial kitchen, community café, and four bed and breakfast units above the store and café. There are also two one-bedroom apartments managed by Tse’khene Community Development Corporation. The McLeod Lake Tse’khene are now ready to diversity their economy and get involved in tourism. Members provide expertise in wilderness activities, story-telling, hunting and trapping, and preparing traditional foods. The Band is currently working on upgrading a portion of the “Grease Trail” that runs through their community. This trail was traditionally used to connect communities across the west, to the coast where goods were traded along the way. Much of the information in this article was taken from the McLeod Lake Indian Band Community Profile, and was approved for publishing by the Band Administrator. The traditional territory of Lheidli T’enneh Nation encompasses over 4.3 million hectares of north-central British Columbia. This land base stretches from the Rocky Mountains in the east, to the interior plateau, and includes the land which the City of Prince George now occupies. The Lheidli T’enneh have resided and been stewards of their land for over 9,000 years. The original inhabitants of this area are Dakelh or Carrier people. The word Lheidli means, “where the two rivers flow together”, and T’enneh means, “the People”. Interpreted, Lheidli T’enneh means “the people who are of the confluence of the two rivers”, referring to the Nechako and Fraser Rivers. You can view the confluence of the two rivers from Lheidli T’enneh Memorial Park as you walk along the Heritage River Trails. Reconstructed Pithouse in Forests for the World, Prince George. Spend the day at Lheidli T’enneh Memorial Park and walk around the original Lheidli T’enneh village site. Here you can also visit Exploration Place Museum and Science Centre where you can view images, archival documents, oral histories, and other artifacts in the permanent exhibit, Hodul’eh-a: A Place of Learning. You can also visit a reconstructed Dakelh-style pit house in Forests for the World, built in 2014 in partnership with the University of Northern British Columbia, under the guidance of Lheidli Elders. Historically, Lheidli T’enneh would travel to a number of camps throughout the year for gathering, fishing, and hunting. During the winter months they would stay in permanent winter camps and reside in pit-houses. Located 111 kilometres east of Prince George is the Ancient Forest, formally named Chun T’oh Whudujut, meaning “a large area of growth, over a big amount of time”. As stewards of their land, Lheidli T’enneh Nation will soon be managing this beautiful park and protected area of old and historic growth. The park is abundant in nature and protected species. Chun T’oh Whudujut has boardwalk access for all travellers and is admired by students and hiking groups located near and far. The Lheidli T’enneh economy is currently based on timber harvesting, natural resource management, and government program delivery. They are currently pursuing opportunities to diversify and create more employment and business opportunities to increase revenues to build capacity of Lheidli T’enneh’s government, provide children and youth with a better education, and to improve health care and programs and services to Elders. Lheidli T’enneh’s most recent projects include a pavilion constructed in cooperation with the City of Prince George in Lheidli T’enneh Memorial Park, and the purchase and renovation of a building in the downtown core which will provide conference and catering to the general public. Lheidli T’enneh welcomes proposals to partner in economic development initiatives through their traditional territory and sees these partnerships as a key element in economic development growth. The Lheidli T’enneh have partnerships with the City of Prince George, the Regional District of Fraser Fort George, and the Prince George Airport Authority. They are working to improve their economy, as well as contributing to the region of which they are a part.